The large room includes a double bed, TV, wardrobe, chest of drawers and desk. It has a big terrace with a small table and chairs. Upon request, breakfast can be served on the balcony. 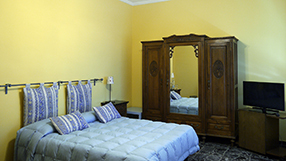 The large room, with classic décor, has a double bed, sofabed, TV, wardrobe and chest of drawers. 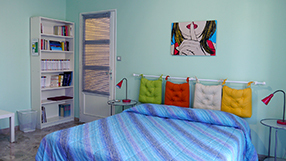 The room is also suitable for families as the sofabed can be opened and be used as an additional bed (140cm x 200cm) without compromising on the space of the room. The breakfast room can also be used by guests during the day and the fridge and kettle are at our guests’ disposal. The ample terrace with table and chairs can also be used by guests. Breakfast is served at the preferred time, agreed with the owners upon check in and it can also include homemade cakes, jams and biscuits, as well as fruit from the garden. Should the weather allow it, breakfast can also be served on the terrace. The spacious bathroom, shared between the 2 bedrooms, has a large bathtub with shower, sink, wc and bidet. Towels, shampoo and bodywash are provided, together with hairdryer and first aid kit. When weather allows it, the garden chairs, table and sunchairs are at our guests’ disposal to relax or read a book in the shade of the big willow tree. At the back of the house there is also a covered parking area for 2 cars. Built in early 1900s, the house has been restructured in 2960 and more recently in 2012. The house is split in 2 apartments on 2 levels. 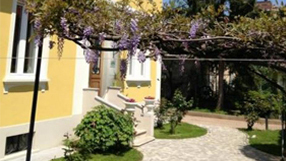 The owners, Mara and Rino, live on the ground floor and the B&B is located on the 1st floor (with no lift), accessible via a separate entrance on the side of the house. 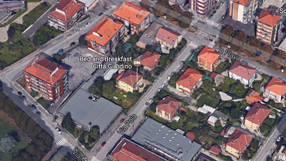 The B&B is located about 1km to the motorway junction (tangenziale Sud/Corso Stupinigi) and about 400 metres from the tram line number 4 which links to the city centres. Bus stops and shops are less than 50 metres away.